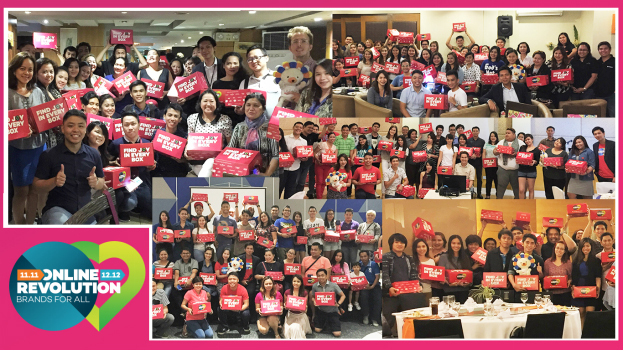 Lazada Roadshows in key cities in the country. In preparation for Lazada’s upcoming Online Revolution Sale on November 11, the Lazada Affiliate Marketing team went on a roadshow tapping some of the Philippines’ key cities namely Manila, Davao, Cebu, Iloilo and Bacolod to promote the affiliate program as well as the grandest online sale of the year. During the 4-day roadshow, the cities’ top bloggers and influencers were given an introduction to Affiliate Marketing in order for them to earn while promoting Lazada. With the Online Revolution fast approaching, the attendees of the roadshow were also given the privilege of knowing in advance some of the great deals that will be released on Nov. 11. Some of the deals that have caught the attention of many include the Starmobile Play Click smartphone that will sell for P999 on 11.11, the inflatable sofa for P469, and the women wowed over the L’Oreal Color Riche lipsticks that will be priced down to P199. In order to know more about the deals that will be released during the 11.11 Online Revolution, make sure to follow Lazada’s Affiliate bloggers and influencers. With Lazada’s ever-growing assortment of merchandise in their online catalogue, attendees of the Affiliate Roadshows were given the Box of Joy, as a sample of the products carried by Lazada. Each Box of Joy contains a variety of products from shampoos, toothpaste, facial creams, and lotions–all sponsored by Lazada’s brand partners. It is a proof that Lazada is not only just an online store for electronics and house ware but also a place to buy even grocery items. It was also during the roadshow that the affiliate-exclusive raffle mechanics for the Online Revolution was announced. Affiliate bloggers only need to come up with five (5) blog posts until Dec. 12 in order to qualify for the raffle. Social media promoters also qualify in the raffle with a minimum of 3 social media posts about the Online Revolution per week. In addition to the winner of the 55” ACE LED TV and a Creative SBS 120 speakers, there will also be three weekly winners of special prizes such as camera drones, hoverboards, headphones, LED TVs, and many more! This is to encourage them to post more and to also thank them for their effort. Lazada’s Online Revolution started in 2012 and is now the biggest online sale in Southeast Asia. It is a month-long celebration of great deals across 17 product categories. Following the mega day on Nov. 11, Lazada will hold its weekly campaigns namely Beauty Fanatic Week (Nov. 14-19), Family Week (Nov 20-24), Techies Week (Nov. 29 – Dec. 2) and Trendsetters Week (Dec. 3-6). Also, a highlight of the Online Revolution would be its Pinoy Cyber Sale running from Nov. 25 to 28. This sale will be similar to the Black Friday and Cyber Monday Sale yearly held in the US. This event is organized together with other e-players with the goal of increasing e-commerce penetration in the country. Finally, Lazada will conclude Online Revolution through a 6-day Mega Sale starting on Dec. 7 until Dec. 12. Stay tuned through this channel for the next installment of deals which will be available on Nov. 11.